Four views over time of the North Broadway (Buena Vista) Bridge. In the photo above (taken from the North Spring Street Bridge just downstream in April 2014) this long viaduct is pretty much back to its original appearance. All of the architectural details from the original bridge built in 1910 have been restored. The last time I visited was back in 1999 when they were retrofitting this bridge. In the photo above, the bridge is closed to traffic and the bottom of the arch (and the deck) have been removed. They must have restored the elaborate decorations on the bridge while they were strengthening it for earthquakes. In the photo above, we see how the bridge (shown behind the N. Spring Street Bridge) looked sometime before 1994 with the old Sante Fe Railroad Bridge behind it (and with the fluted columns, bastions, and other decorations still missing). In the photo above we can see how the bridge looked just after it was built, including most of the original architectural elements. 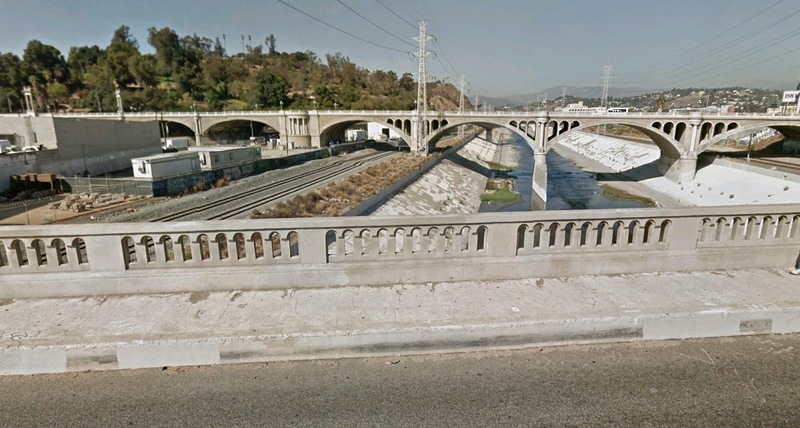 It's probably cheaper to just replace these old bridges, but it's even more important to the culture of Los Angeles to preserve it's past. Los Angeles County Bridges: California Bridges: North Broadway Avenue Bridge across the Los Angeles River (1) by Mark Yashinsky is licensed under a Creative Commons Attribution-NonCommercial-NoDerivatives 4.0 International License.